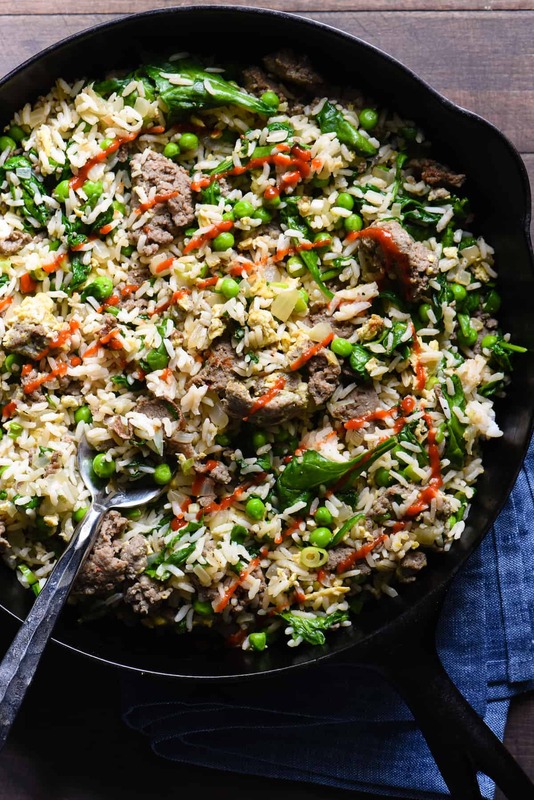 Break out a big cast iron skillet and feed a crowd with this Breakfast Fried Rice. Full of lean turkey sausage, eggs and lots of veggies, this will keep the crew fueled all morning. In culinary school, one of the early classes I took was called “Breakfast & Pantry.” Each morning, the class was responsible for putting on a HUGE breakfast buffet that was open to the public. When I say huge, I mean huge: there were omelets, scrambled eggs, eggs benedict, frittatas, waffles AND pancakes AND crepes (really), multiple kinds of sandwiches, a huge fruit platter, sausage AND bacon AND ham, homemade biscuits with sausage gravy, homemade pastries and breads, and probably a bunch of other things I’m forgetting. Oh, and fried rice. Of all the things we made each morning, the fried rice was always the head scratcher for me. Like, why is this on the breakfast buffet? But actually, on my recent trip to Hawaii, fried rice was always on the hotel’s breakfast buffet, too! And you know what? Why not. It has eggs, sausage, a little bit of carbs to get you going for the day, and you can fill it with a decent amount of veggies if you want, too. I’m into it, especially for feeding a crowd gathered at your home for the holidays. Break out the biggest cast iron skillet you have (or two for a double batch if you need it), and you can feed the whole crew with one easy dish. I like to use a cast iron skillet for fried rice, because the pan achieves a hot, even heat perfect for creating some little crusty bits (which are little flavor bits, really). A wok works great, too! 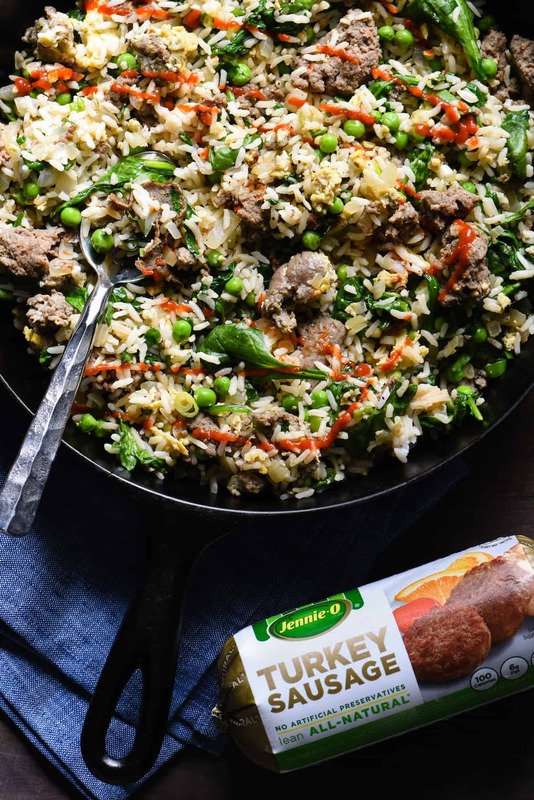 My Breakfast Fried Rice starts with JENNIE-O All Natural Turkey Sausage, which is a versatile, low fat alternative to traditional sausage. I put the whole package right in my skillet, and then crumble it up with a wooden spoon as it cooks. Just like I enjoy sneaking greens into my smoothies, I like to incorporate as many veggies as I can in this breakfast, including a full cup of peas and an entire box of spinach. If your crew doesn’t love spinach as much as I do, feel free to cut back on the amount, or swap it out for a different type of vegetable altogether. This Breakfast Fried Rice is seasoned with soy sauce, as is traditional for fried rice. But I also drizzled in a touch of maple syrup since this is breakfast, after all. Trust me, just a touch! 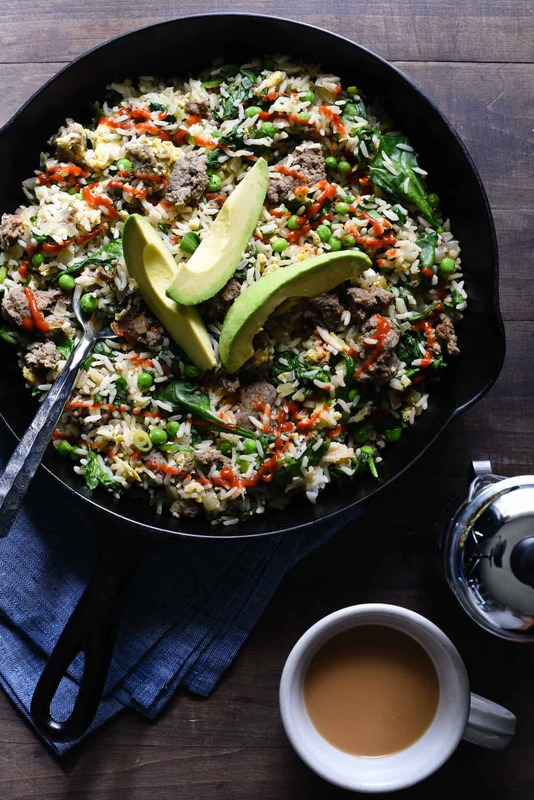 Totally optional, but top the Breakfast Fried Rice with avocado to make it a little more special. Heat large cast iron or other heavy skillet over medium-high heat; spray with cooking spray. Add sausage to skillet and cook 8 minutes or until sausage is almost cooked through, breaking up sausage with back of spoon as it cooks. Add yellow onion to skillet and cook 3 to 5 minutes or until onion is softened and sausage is cooked all the way through, stirring occasionally. Reduce heat to medium; push sausage mixture to outside edges of pan. Spray center of pan with cooking spray; pour eggs into center of pan. Cook 1 to 2 minutes or until eggs are hard scrambled, stirring constantly. Stir in spinach, green onions, rice, peas, maple syrup, soy sauce and pepper. Cook 4 to 5 minutes or until spinach is wilted and everything is warmed through, stirring frequently. Serve topped with avocado and sriracha, if desired. Home Chef Tip: Stop by your favorite Chinese takeout place a day or two prior to making this recipe for a few containers of cooked rice. That’s the easiest way to make fried rice! Greek Chicken Fried Rice – kind of like a Greek salad, but with rice. Sriracha-Cashew Chicken Fried Rice – one of my favorites! 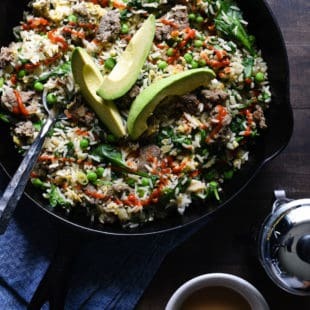 Picadillo Fried Rice – a Latin twist on fried rice. Kimchi Fried Rice – a great way to use up that lingering jar of kimchi. Shrimp Fried Farro – not quite fried “rice,” but whole grain farro.